On November 30th, the USDA’s Economic Research Service (ERS) released revised forecasts for 2018 farm incomes. The revised forecast suggest that aggregate net farm income is expected to decline by 12.1 percent from 2017 to $66.3 billion. The revised forecast, however, is more optimistic than previous 2018 forecasts released in August ($65.7 bil.) and in February ($59.5 bil.). Historically, ERS’ November net farm income forecast is a pretty good predictor of official net farm income estimates, yet the forecast is slightly downward bias. If the historic pattern continues, net farm incomes are expected to decline by a smaller margin than the current forecast suggests. ERS releases four farm income forecasts a year: in February, in August, in November, and in February following the reference year (when the first forecast of the new year is released). The official estimates are released in August following the reference year but are periodically revised. In a previous article, we show that ERS’s forecasts of net farm income improve throughout the year as new information is added (farmdoc daily August 25, 2017). The initial 2018 net farm income forecast released in February suggested a drastic reduction in farm sector returns, yet consistent with recent patterns, the August and November revisions suggest smaller income declines (farmdoc daily February 21, 2018). 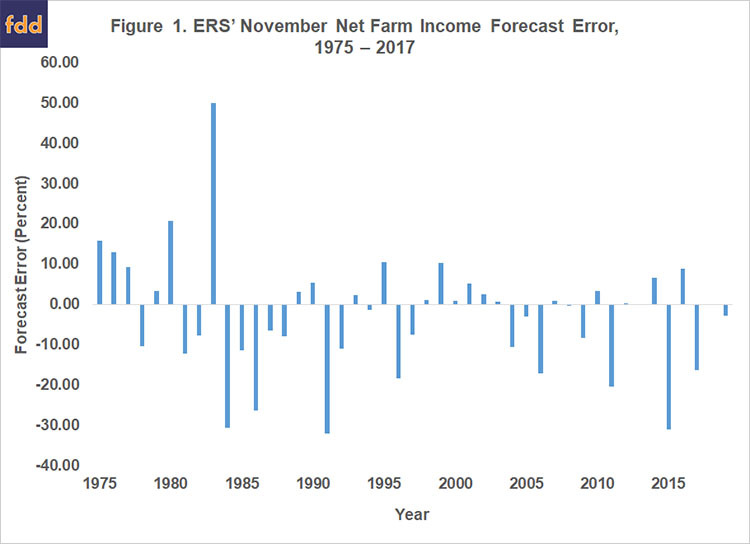 Figure 1 plots the forecast error for ERS’s November net farm income forecast since 1975. The bars represent the difference between November forecast values and the first official estimate in percentage terms, with negative values associated with under-prediction. Since 1975, over-prediction and under-prediction were roughly equally likely. Approximately 51.2 percent of the forecast errors were negative. However, the under-predictions were more pronounced, with an average forecast error of –2.75 percent between 1975 and 2017. Since 2000, ERS’ November net farm income forecast errors were equally likely to be positive or negative. However, the larger forecast errors were associated with under-prediction, leading to an average forecast error of –4.37 percent. If the recent historical pattern holds, 2018 net farm incomes are likely to be higher than the recent forecast suggests. A –4.37 forecast error, suggests observed net farm income should approach $69.3 billion. This adjusted forecast is still below 2017 official estimates but reflects a more modest 8.2 percent decline. Kuethe, T., T. Hubbs and D. Sanders. “Interpreting USDA’s Net Farm Income Forecast.” farmdoc daily (7):156, Department of Agricultural and Consumer Economics, University of Illinois at Urbana-Champaign, August 25, 2017. Kuethe, T. “Will Farm Income Really Drop to a 12-Year Low in 2018?.” farmdoc daily (8):30, Department of Agricultural and Consumer Economics, University of Illinois at Urbana-Champaign, February 21, 2018.